This entry was posted in humor, Humour, poem, poetry, Uncategorized and tagged Humor, madonna, poetry, reality shows, sharon osbourne, spells, stevie nicks, taylor swift, witchcraft, you tube. Bookmark the permalink. With those tags you’ll probably get a lot of action. I enjoyed this one, well done. Thank you! Well, I’m hoping so! Yes, well, what better adjective can be used to describe Stevie Nicks, especially if she were to host a witch’s reality show. Glad you liked this one. I’m glad you turned them into frogs. Ha ha! Yes, well, they did kind of deserve it! I’m working on my pitch! Ii would really like to see a lot of these reality show judges turned into frogs sometimes!! I suppose this one would provide such a premise. I’ve only seen a few reality shows, Marissa, but the ones I have seen, for the most part I was not too impressed with the judges. I mean, REALLY????? Yes, sometimes I think they are thinking more about the celebrity of the judges than who is actually giving worthwhile commentary. Social media can make all of us famous for 15 minutes and sometimes more. I see a lot of people getting carried away by it. Can’t wait to see what you make out of it Peter! You definitely have my vote. I bet a lot of contestants would love to have the power of turning the judges into frogs. I have no doubt April! Well I’m sure if it was anything but witchery, Simon Cowell might be the first in line. And as for Stevie Nicks, here she is the subject of many a men’s dreams. Simon is on everyone’s list to get the eye of newt spell. Stevie Nicks has a lot of guys under a spell. For sure on both counts! That’s great! What a tough panel, but they got a surprise. I love it, great Halloween fun with an all star cast! I was thinking of posting closer to Halloween, but I thought it was so fun…I just couldn’t wait. Oh well, if the 99 cent store can pull out it’s decorations the day after Labor Day, then I guess I can publish this!! Yep, Marissa!!! Only three frogs. They should have been nicer to witch Marissa! Love it!!! Brilliant. I don’t know the programme and I have no idea who the Swift woman is but I do remember Fleetwood Mac. Sounds like a fun talent contest. Wizard in fact. Or do I mean it is a load of old warlocks? You are very fortunate not to know who Taylor Swift is. In fact, I have a whole new level of respect! Yes, Wizards, witches, warlocks, whatever floats your boat! You know what, Shelly Silverstein? You’re brilliant! Publish a book, publish a book, publish a BOOK! I was waiting for someone to pick up on my little pun. Leave it to you Kim! You flatter me! You certainly “showed” them! Marissa, since we have had Survivor out on an island and the Big Brother show in a condo living situation we could have a really old “haunted house” setting. Oh yeah, that’s a good one! That would be poem worthy all unto itself…except I hate to get too political. The haunted house setting is a great idea. And I bet the votes came pouring in!!!!!!!!!!!! Mine did!!!!!! Oh yes, I’ll have to add on a last stanza to include how I ended up totally winning the show. Good one Colleen! Very clever and engaging. Outstanding! Thanks Mike! Glad you enjoyed. Sharon Osborne, Madonna, Taylor Swift and Madonna on one stage. Now that would be something. My only concern would be. How are you going to keep Sharon Osborne from eating Taylor Swift alive? Yes, I imagine she would just see her as a great big turkey leg in more ways than one! Fortunately, this is fiction. I don’t watch that much tv, so I am surprised this was fiction. I thought it really happened. Yes, well, it did but I changed the names to protect the innocent. I only change the names to protect the guilty. That is why I never use your name. Of course my missus has her own broomstick….not just for a full moon I might add! I have no doubt. I have seen her riding it around the market place. All the vendors are sure to put out their finest wares when her ill wind blows. Crikey after several nights scoffing strong curry her ill wind blows something rotten! Oh yes, THIS! Spectacular as always. This is definitely my favorite, though. I know nothing of witchy ways, but if I did – it’d be you I’d pick from the judge’s perch. Dark hair and bewitching eyes matched with your wicked word spells – I’ll pick you every time. This poem is getting printed and pinned to my bulletin board. If you haven’t read Marissa yet, you really must check her out. “Wicked Wonderful.” Her whimsical poetry makes me smile without hurting my head. 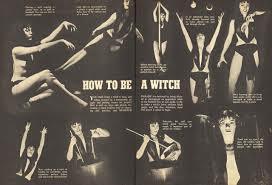 Keeping with the theme of witches, check her out for something light and fun on a Supermoon Sunday. Love this poem and thank you for the dedication! Great choice of judges, especially as Paula Abdul seems to have disappeared off the face of the earth. Ah, Paula Abdul would have been a good one although I’ve no doubt we’ll see her tonight flying her broomstick over the supermoon. wow, I will be looking for that! Oh yes, my kids liked the directionally challenged line too. I think they can relate since so often they get in the car with mommy and have no idea where they are going to end up! I think I might be the president.